I'm moving today and tomorrow to a new home in a new state. I'm packing up the computer now, so I will be off line until at least Friday night. Until then, don't forget to check out The Guns of Shadow Valley today and Thursday for new pages. 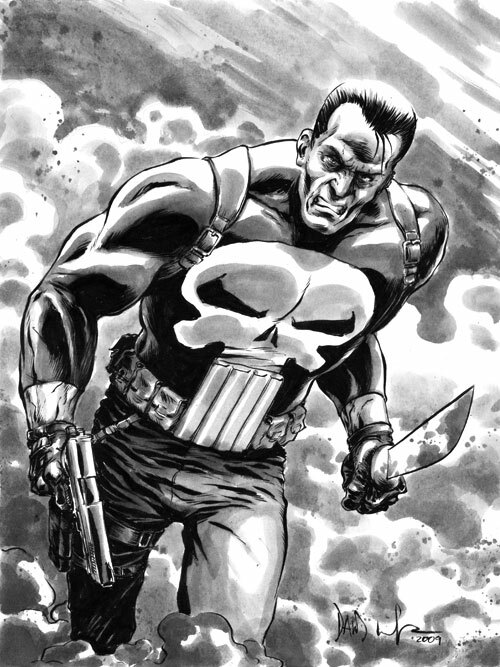 When I'm back up and running I'll have some new art for you to look at. See you later! I've been drawing lots of monsters and violence lately. Here's a little something to clense the pallet before the next onslaught. 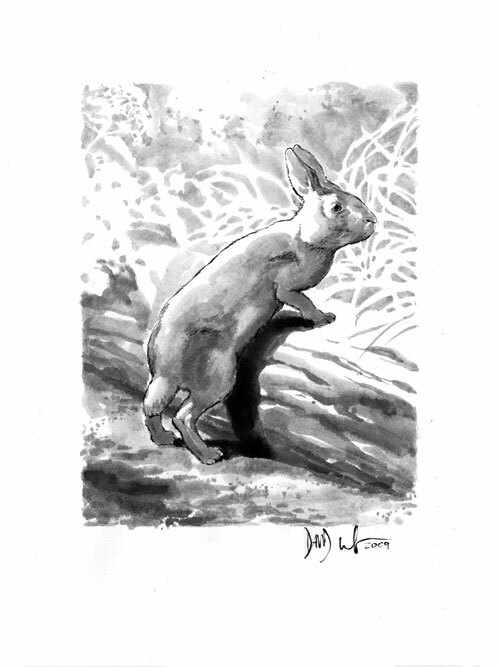 I did this quick drawing of a rabbit spotted at a park in Pittsburgh, for my mom's birthday. When isn't he angry? This time he's got a knife and a gun. Watch out! 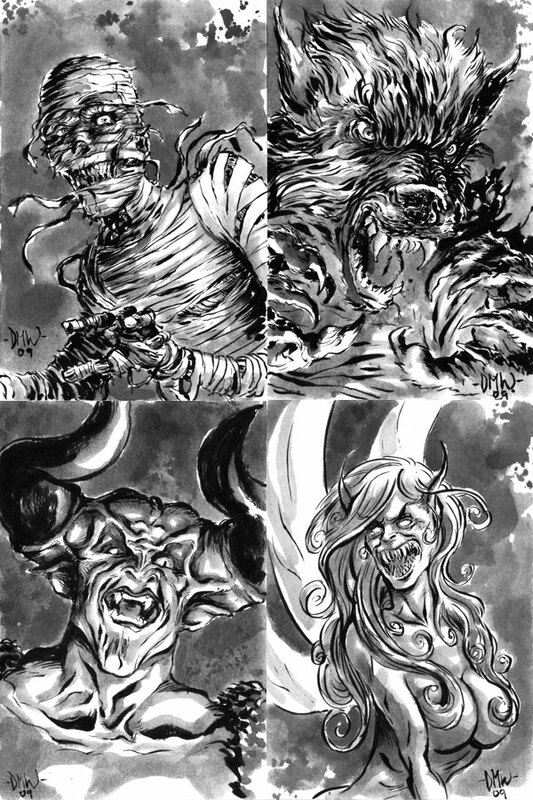 Monster Mini Sketch Sale: Over! That's it folks, I've got all the orders I can possibly take. After some family business on Saturday, I will be working diligently to finish the rest of these sketches and have them in the mail sometime next week. 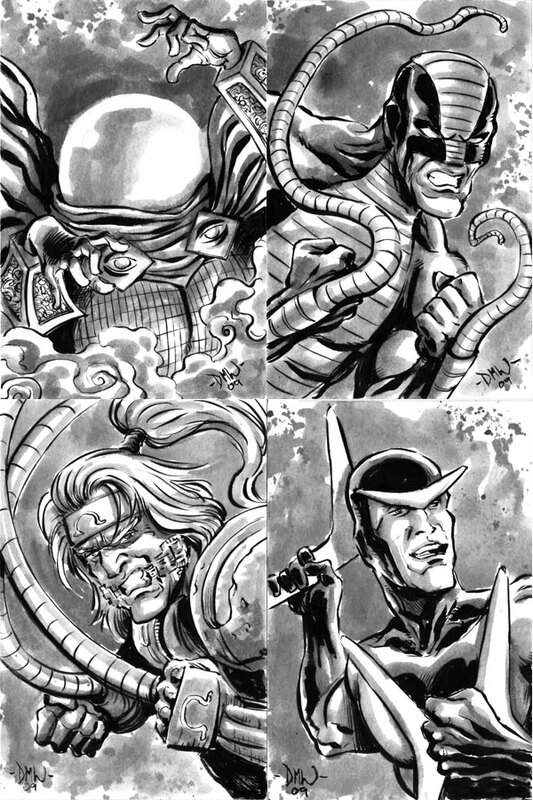 I would like to express my heartfelt thanks to everyone who ordered a sketch, I really appreciate the business! If you were hoping to get a sketch or two but couldn't get your order in on time, it's likely I'll do this again. Whether that's sooner or later all depends on my circumstances. I will continue to post images of the sketches as they are finished. 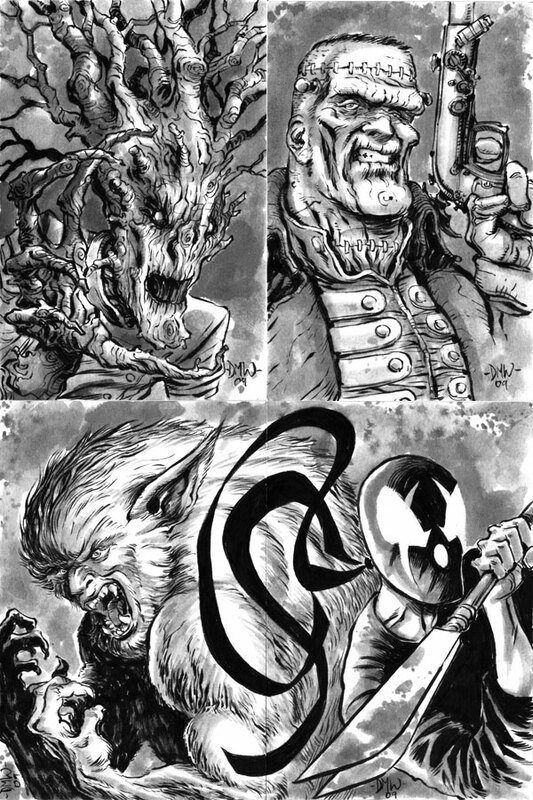 And eventually, I might even collect some of them into a sketchbook for sale in the future. 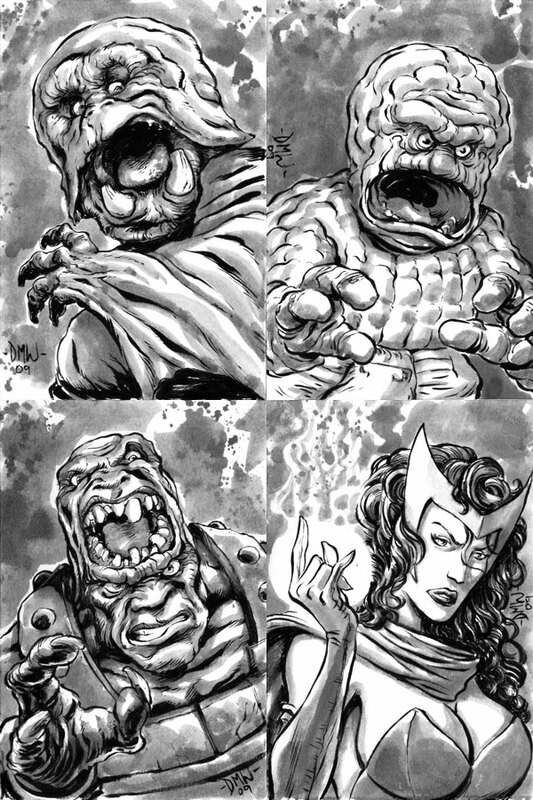 Monster Mini Sketches, batch 5 - Last Call! LAST CALL! 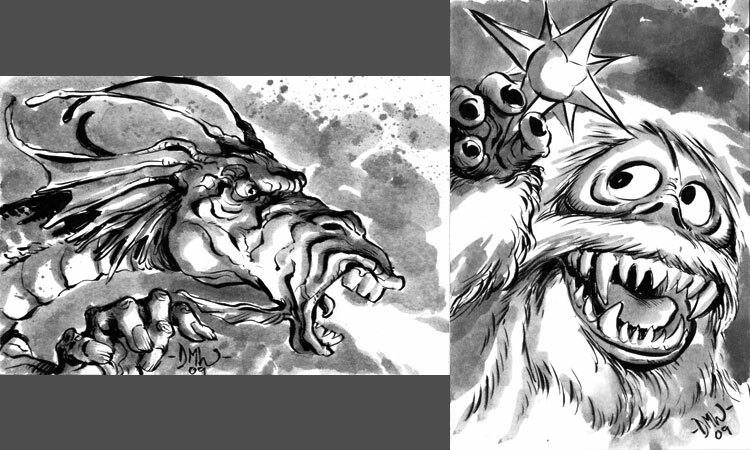 I'll take just a few more mini-monster requests. AFter that I've got to close the doors for a while. 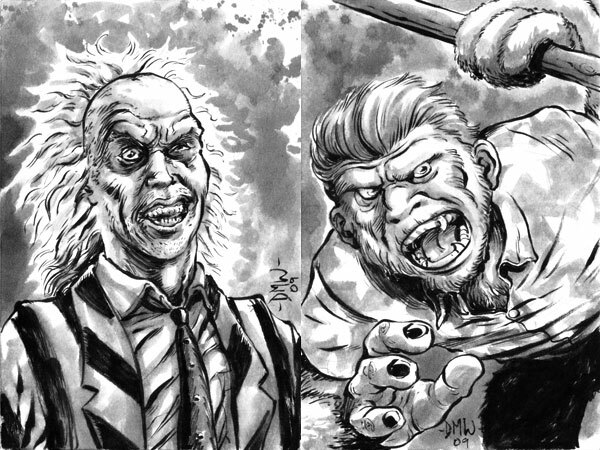 Thanks so much to everyone who has ordered a sketch, it's been lot's of fun! 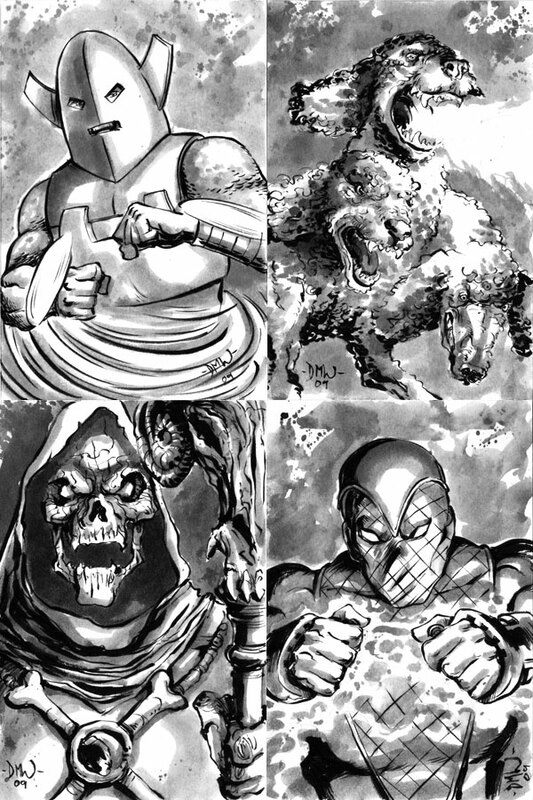 Monster Mini Sketch Sale Ends Soon! Thank you all so much! I've been inundated with orders. I'm also moving at the end of the month, so it's been extremely busy. 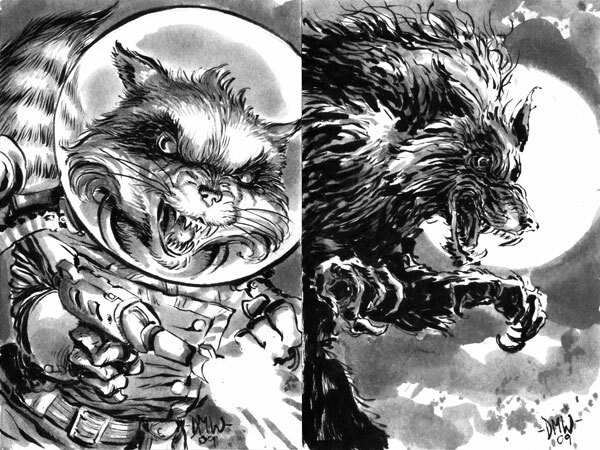 I want to be able to get all these mini sketches finished and mailed in plenty of time for Halloween. So, the sale will be closing very soon! If you want something, let me know right away! And thanks again, everybody! These have been a ton of fun to do. The Guns of Shadow Valley - Chapter 2 has begun! Some of you may have heard about my webcomic: The Guns of Shadow Valley. If you haven't, then I'm creating this here blog post to give you the lowdown and encourage you to maybe, y'know, check it out! The Guns of Shadow Valley, or 'Guns', or GoSV, is a serialized adventure webcomic. It's a Western, but with a Superpowered twist. 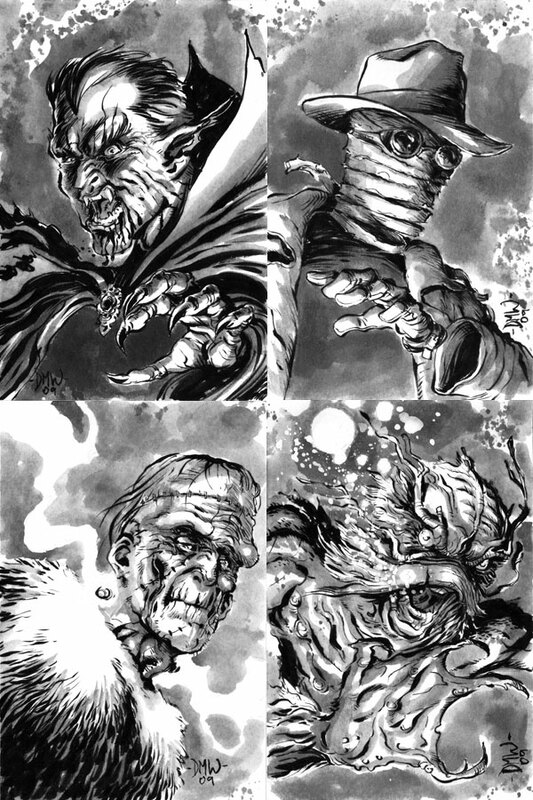 It's sort of like the Magnificent Seven meets the JLA, or if you're a Marvel fan, the Avengers, or the X-Men. "Somewhere in the mysterious Shadow Valley lies a secret that could forever change the face of the frontier. To protect that secret, a posse of gunmen with special abilities must come together and defend against a tribe of ghostly warriors, an advancing army led by a deranged Colonel, and the perils of the valley itself. 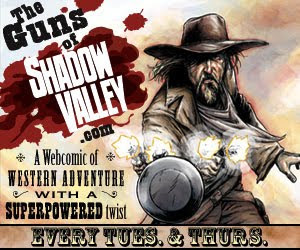 The Guns of Shadow Valley is an exciting new Western adventure series from the creators of Scar Tissue. Set in the 1870s in the Oklahoma Territories, Guns is a tale of intrigue and adventure that puts a new spin on the Old West." New pages go up every Tuesday and Thursday at: gunsofshadowvalley.com The first chapter is already up and we've just started to post pages from chapter 2. And as time goes on, we'll be adding more goodies for you to explore on the website. Check it out, it's totally free. If you like it, you can subscribe to the feed, leave a comment, become a Facebook fan, all that good stuff! Thanks for your time, and we here at Guns really do appreciate the support! 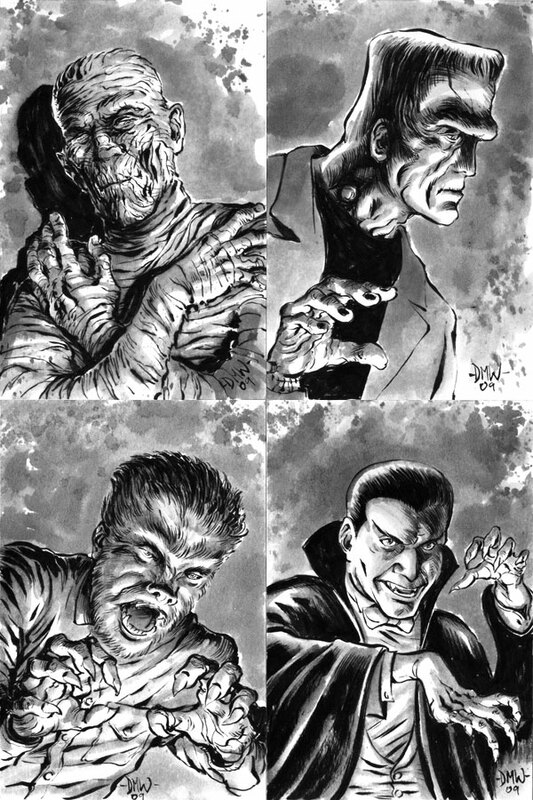 More monsters for your viewing pleasure! As always, if you want one, or more than one, email me or use the PayPal button below. I'll be taking orders for about one more week. Another batch finished! 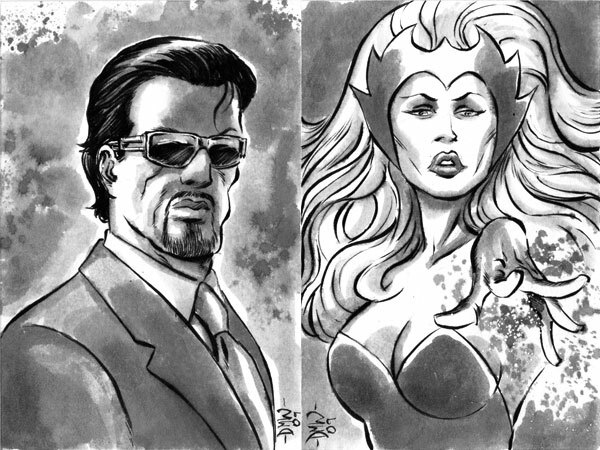 There's still time if you want a sketch, or multiple sketches, of your own. Email me at dave@davedrawscomics.com or use the convenient PayPal button below. If you need international shipping, email me for the rates. 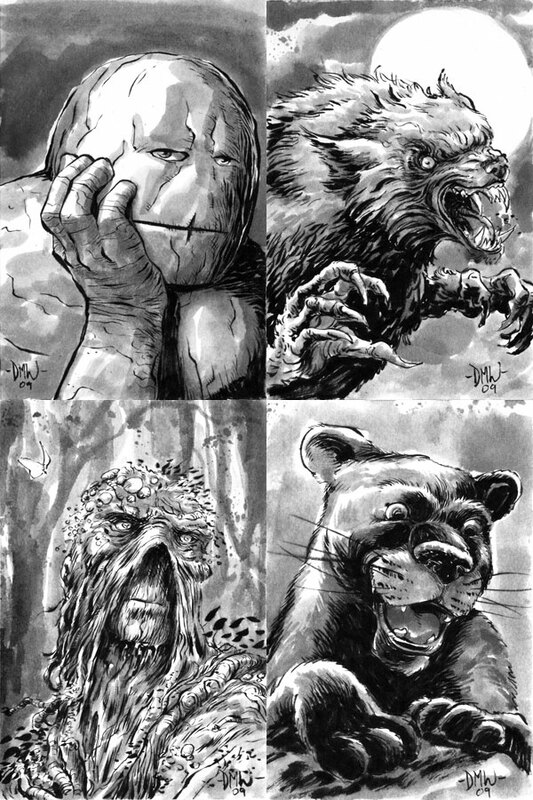 Here's a few more finished Monster Mini Sketches. I'm going out of town this weekend. Go ahead and place orders either through the buttons below or email me, I'll be able to respond when I get back early next week.